Will Latino voters stand and be counted? It seems every election in Texas is accompanied by big talk from political pundits that, at long last, the slumbering Latino vote will become a decisive force at the ballot box. So far, it’s been more promise than reality. But this year may finally be different. No, really. The campaigns for Democrats Hillary Clinton and Barack Obama have streamed into Texas ahead of the state’s critical primary on March 4. Both campaigns are convinced that the Latino vote, which will likely comprise a third of the Democratic primary electorate, will be the key to Texas. For Clinton, the calculus is simple. The Latino vote has been an indispensable segment of her coalition. She carried that vote in Nevada, Arizona, and New Mexico. In California on February 5, Latinos probably saved Clinton’s candidacy by delivering a critical win in the nation’s largest state. Despite polls showing Obama surging ahead there, Clinton secured an impressive 10-point victory. Latinos made up 30 percent of the vote, a record turnout, and 67 percent went for Clinton, according to exit polls. The Clinton campaign hopes to duplicate that scenario in Texas. Much of the credit for the Latino turnout in California went to Clinton’s field director, Mike Trujillo, a former staffer for Los Angeles Mayor and Clinton supporter Antonio Villaraigosa. Clinton sent Trujillo to Texas to rerun the California playbook. Moreover, the Clintons have a long history in South Texas, dating to the early 1970s, when Hillary helped register Latino voters along the border for the McGovern campaign. She and Bill are friends with some of South Texas’ best-known politicians, including former San Antonio Mayor Henry Cisneros. Garry Mauro, the longtime Clinton friend who’s working on her Texas campaign, has helped with the Clintons’ appeal to Latinos in the past. In fall 1992, Mauro, then-land commissioner, designed a South Texas strategy that forced George H.W. Bush to invest money in the state he called home. Even Obama’s supporters concede that Clinton has considerable appeal among Latinos. “That Clinton name still has a lot of currency, and Bill Clinton especially is still very much well liked among Latinos in Texas,” said Rafael Anchia, a Dallas state representative who’s helping the Obama campaign reach out to Latino voters. The question is not whether Clinton will poll well with Latinos, but how well. To have any chance of winning in Texas, Obama will probably have to keep Clinton’s share of the Latino vote under 60 percent. His camp believes he can nibble away at Clinton’s edge in the weeks before primary day. Anchia said that voters in general like Obama more as they get to know him. Obama ads have debuted on Spanish language radio and television stations. Anchia says the campaign believes that while older Latinos may remain loyal to Clinton, the younger Latino voters in Houston, Dallas and San Antonio will flock to Obama, who’s proven popular with the youth vote. Several young Latino state representatives from urban areas have endorsed him, including Anchia, Trey Martinez Fischer (San Antonio), Norma Chavez (El Paso), Ana Hernandez (Houston), and Eddie Lucio III (Brownsville). And Anchia points out that North Texas has more Latinos than South Texas. The question is how many of those urban Latinos can vote and will vote in the Democratic primary. Those numbers are difficult to discern — after all, voters don’t mark their ethnicity on the ballot. In an effort to understand the potential Latino impact on the primary, the Observer asked Leland Beatty, an Austin political consultant who specializes in voter identification, to analyze recent Democratic primaries and make an educated projection of Latino turnout [see graphic page 10]. Beatty qualified his analysis by saying that the 2008 primary may attract so many voters that it could be difficult to model. It’s possible the Democratic primary turnout will be double that of 2004. With so many new voters flooding the polling stations, predicting how many will be Latino and how many will be African-American is tough. Based on past primaries, Beatty’s computer models projected that Latinos would comprise 31 percent of the vote. The largest group lives in South Texas, where the more than 183,000 Latino voters make up more than 75 percent of the electorate. The Latino vote will be the story to watch and could determine who wins the most important Texas primary in two decades. A federal appeals panel ruled Friday that English-language instruction law is so flawed that it "may well retard or reverse whatever progress has been" made in the instruction of more than 134,000 Arizona children who are struggling to learn English. But the 9th U.S. Circuit Court of Appeals in San Francisco said two changes in the measure could bring Arizona's long-running dispute over English-language instruction to a conclusion. "There is reason, then, to hope . . . that this dispute, which has been in the courts longer than it takes a student to go from kindergarten to college, may finally be nearing resolution," Judge Marsha S. Berzon, writing for the three-judge panel, concluded. The court upheld a ruling by U.S. District Judge Raner Collins of Tucson, who determined that a law passed by the Arizona Legislature in 2006 failed to comply with a previous court ruling requiring improvements in instruction for English-language learners in the state's public schools. Most are children of immigrant parents who speak Spanish. Collins has set a March 4 deadline for the state to come up with a workable plan or face potential fines of up to $1 million a day. Evidence so far this session suggests lawmakers have not made much progress toward that goal, although the deadline is less than two weeks away. The 2006 law would spend an additional $14 million a year on English learners. Legislators face a deficit of more than $1 billion in the budgets for fiscal 2008 and 2009, and have balked at spending more money for English-learner programs. Legislators have repeatedly said they believe their approach to English-education funding is correct, fair and equitable, and that the 2006 law took the necessary steps to solve the problem. Some state officials have said they would appeal the case to the U.S. Supreme Court if necessary. The court indicated Friday that changes in policy rather than more money would be the key to resolving the case. Collins had ruled that the law didn't meet federal standards for providing equitable education opportunities. He specifically criticized two components of the state law: that students could only benefit from English-learner funds for two years, and that the state could use federal dollars earmarked for poor students to supplant the state's investment in English learning. The appellate panel agreed that the Legislature needs to change those two aspects of the law. In the 91-page ruling, Berzon wrote that a solution is important in part because Arizona's English-learner students continue to lag behind statewide average test results. "If anything, after 2000, when Arizona moved away from bilingual education and required most courses to be taught in English, regardless of students' language abilities, these challenges have become greater: A 10th-grader, for example, who speaks no English but must pass a biology course taught entirely in English will require considerable assistance," Berzon noted. Arizona's ELL funding system and, in fact, introduces new problems." "In short, despite considerable efforts, and some improvements in outcomes, Arizona, as a state, does not appear to have turned the corner on ELL education," the ruling stated. The case of Flores vs. Arizona, which originated in the Nogales Unified School District, has been continuing for 15 years. The appellate panel heard arguments on the appeal of Collins' decision in December. The panel concluded that state officials could resolve the case by abandoning the two-year funding cutoff and declining to consider federal funds in the grant-making process. Central Texas school districts losing principals to students' peril. Geneva Oliva estimates conservatively that she saw seven principals come and go while her children attended Johnston High School in East Austin from 1994 to 2003. The faces changed with such regularity that she says she didn't recognize the principal from year to year. "Every time a new principal came in, they'd come up with a new program," she says, "but the new program was never completed because the principals left. What good is it to have good ideas if they aren't there to finish it off?" School districts nationwide are finding it harder to hold on to principals as standards get tougher and the list of demands from the state and federal governments gets longer. Statewide, high turnover is particularly apparent in high schools. About 61 percent of high school principals leave their schools or the field within three years; by the fifth year, that figure increases to 76 percent. Austin's turnover rates are slightly higher: 64 percent after three years and 82 percent after five years. The district's annual high school principal turnover rate is just over 25 percent, a figure that is on par with other urban districts, where yearly turnover tends to average 18 percent to 25 percent. When the principalship is a revolving door at a school, experts say, it trickles down to teacher retention efforts and school reform initiatives, which have vast implications for a district like Austin, where the 11 traditional high schools are in various stages of reform, with middle schools soon to follow. Local changes have included redesigning high schools to resemble colleges. "We know that school reform takes time — much more than one year's time," said Ed Fuller, associate director of the University Council for Educational Administration at the University of Texas. "If a principal leaves within three to five years, the principal's vision for reform is left incomplete. Over time, teachers become jaded and simply ignore the reform effort. ... Teachers believe the principal will leave and all of their efforts will be wasted." Principal flight at some campuses has been extreme: Johnston High went through 11 principals in 12 years before Celina Estrada-Thomas arrived in 2005, the same year that Reagan High in Northeast Austin had four principals in one year. Education experts, principals and parents say the challenges of urban schools, combined with high-stakes testing demands, are driving the trend. Nelson Coulter, principal of Hendrickson High School in Pflugerville, remembers when principals only had to be successful politicians to keep their jobs. Now, Coulter says, they have to be like coaches. "You have to win," said Coulter, a 30-year veteran educator. The accountability system has changed expectations. "While principals put stress on teachers to improve outcomes, teachers often do not lose their jobs over low accountability ratings," said Fuller, who has analyzed cumulative state turnover rates. "Principals do." It's not always clear when principals leave whether they chose to walk out or were forced out, but what is certain is that in high-pressure situations at low-performing schools, they often don't last. Consider the five Austin campuses that have appeared on the state's list of low-performing schools multiple times since the accountability system was enacted four years ago: Johnston and Reagan high schools, Pearce and Webb middle schools, and Pecan Springs Elementary School. Pecan Springs and Webb are no longer on the list. There have been nine principal changes among them since 2003-04. "I'm not saying we want to hold on to someone who is doing a bad job for the sake of stability, but I am really concerned about the pressure that is on principals," said Louis Malfaro, president of Education Austin, which represents 4,000 teachers and staff members. "I think it's crowding a lot of people out of school leadership." Even high-achieving suburban districts, where turnover is generally expected to be lower, have not been shielded from the tumult. Round Rock lost five of eight middle school principals in 2006 and four last year. Rosena Malone was among the five who changed positions in 2006, receiving a promotion to assistant superintendent for secondary schools after serving less than eight months as Hopewell Middle School's principal. "We had an unusually high turnover that year in middle school positions due to promotions," Malone said. Schools that traditionally do well on the state achievement test present their own challenges for a principal. "The difficulty with running a campus noted for its top test scores is that the bar has been raised very high. You have to get your teachers behind you in order to maintain those expectations," said Linda Watkins, former principal at Westwood High School in the Round Rock district. "You also have a group of parents who ... expect their kids to be ready for college, and many of them are aiming for Ivy League universities. The rigor of the curriculum expected in a school like that is very stressful." Michael Houser, Austin's human resources director, said the turnover rates reflect increased accountability in the education system. "The job is extremely demanding and even more so with redesign, high-stakes testing and ranking of schools," he said. Michael Garrison, principal of McCallum High School in the Austin district, said principals aren't alone in feeling pressured to produce. "It's a challenging job anywhere in the system," he said. "But the benefits are huge." To improve retention, school districts must provide leaders with adequate support, researchers say, in the form of well-qualified teachers, autonomy, solid mentoring and protection from community and political pressures. When Brenda Burrell took over Austin's LBJ High School in 2000, some expected her toughest task to be getting the school off the state's low-performing list, which she did in her first year. More difficult to manage were what she called the three P's: "politics, pollutants and parasites." The former principal recalled the arduous task of balancing the concerns of magnet parents and neighborhood parents and dealing with "sacred cows ... people and programs that are dead but keep hanging on." Burrell was removed as principal in 2004 in the wake of a school restructuring plan. Experts say superintendents must be more protective of their principals if they want them to stay. "Just like good principals buffer their teachers from outside pressures, good superintendents buffer their principals from outside influences," Fuller said. Others say aspiring principals must become more knowledgeable about the realities of the position. LBJ High Principal Patrick Patterson works six, sometimes seven days a week. That's the only way he can stay ahead of the 75-hour-per-week job that requires him to be building manager, teacher mentor, parent liaison, community builder, cheerleader, disciplinarian and fundraiser. "If the individual is not willing to work the long hours, if they don't have a family to support them, if the individual is not willing to be at the top — and at the top, you're alone — then this is not the job for them," Patterson said. The Austin district has for several years partnered with the University of Texas' Principalship Program, a master's degree program that provides training in campus leadership. The district has also raised salaries 15 percent to 20 percent over the past three years. Pay for high school principals ranges from $100,000 to $110,000, middle school principals make $90,000 to $100,000 and elementary school principals earn $70,000 to $80,000. When principals stay, the difference is obvious, said Oliva, the Johnston parent. Johnston's teacher turnover has been considerably lower since Estrada-Thomas' stint began, district figures show. "I tell her, 'At least we know that you are here and that you care about our students.' Even the parents are finally coming out after 13 years," Oliva said. Check out the "California Dropout Research Project" site for the data and briefs. A UC Santa Barbara study shows 25 sites, many are charter campuses, account for a fifth of dropouts in the state. The findings are criticized. Just 25 of California's 2,462 high schools account for more than a fifth of the state's dropouts, with the problem heavily concentrated in charter and alternative schools, according to a study being released today by UC Santa Barbara. However, a UCSB researcher said it wasn't clear whether the schools were responsible for the problem or were simply the recipients of a disproportionate share of troubled students. And some educators and school advocates criticized the report -- either for relying on questionable data or for releasing potentially explosive statistics without context. The report, issued as part of the California Dropout Research Project, used readily available state data to compile a list of every high school in the state ranked by the number of students listed as dropouts last year. It showed that, of the 10 schools that reported the highest numbers of dropouts, only one was a traditional, comprehensive high school -- and the principal of that school said it ranked so high because of a data error. The rest were alternative schools, most of them charters and all specializing in education for high-risk students who couldn't make it in conventional schools. Russell Rumberger, a professor of education at UC Santa Barbara and director of the dropout project, said Wednesday that the report wasn't intended to answer questions about why the schools had so many dropouts but rather to give educators a snapshot they could use to map out future research. "Is the school doing a bad job, or are the kids at risk anyway no matter what setting they're in?" Rumberger asked in a conference call with reporters. Either way, he said, the value of the study is in telling the public, "This is where we should be concerned." Rumberger stressed that he wasn't judging the individual schools at the top of the list, but added, "If that many kids are dropping out, it's unlikely that you're doing a good job." That comment angered Buzz Breedlove, director of John Muir Charter School, a Sacramento-based organization that operates programs for at-risk students at 43 locations throughout California. It was No. 1 on the UC Santa Barbara list, with 1,856 dropouts -- more students than are enrolled at the school. "To reconfigure numbers and come up with a dropout rate of 149%, which on its face is ludicrous, doesn't suggest to me that very much thought went into these numbers," said Breedlove, a former nonpartisan policy analyst for the California Legislature. More than half a dozen of the schools on the list had dropout rates over 100% because enrollment is based on the number of students attending classes on a single day in October, but alternative schools typically have students arriving and leaving throughout the year. According to Breedlove, the typical John Muir student is 19, has already dropped out of school two or three times and has completed only 75 of the required 210 credits for high school graduation. The school serves students who are enrolled in several organizations, including the California Conservation Corps. "I would submit to you that one reason that our students drop out the way they do is that, absent our program, they wouldn't be in school at all," Breedlove said. "They would be terminal dropouts." Much the same story came from the No. 2 school on the list, SIATech (School for Integrated Academics and Technologies), a San Diego-based alternative charter with seven campuses. SIATech works with the Job Corps to reclaim students who have already dropped out. Spokeswoman Linda Leigh said a high dropout rate "is one of the pitfalls of trying to recover students who are really high-risk individuals." The only conventional, comprehensive school among the top 10 was Madera High North in the San Joaquin Valley, listed at No. 9 with 539 dropouts. But the school's principal, Ron Pisk, said that figure was wrong, the result of a coding glitch that occurred when the Madera Unified School District recently switched data systems. "It's absolutely driving us crazy," he said. "I've been losing sleep over this." The true figure, he said, is about half what is listed in the report. Four of the schools in the top 10 are charters run by the same couple, John and Joan Hall. Their nonprofit charter, Options for Youth, has campuses ranked sixth, seventh and eighth, and their for-profit charter, Opportunities for Learning, was ranked third. The schools, which allow students to work independently, were the subject of a Times article in 2006 that found they had a poor record of keeping students until graduation. A spokesman for the organization, Stevan Allen, issued a statement saying it was "not at all surprising that schools specializing in dropout recovery have a high number of dropouts -- just as obesity clinics have higher incidences of diabetes and heart disease among their patients. By definition, we are dealing with a population highly inclined to drop out." He estimated that the true dropout rate at the four schools ranges from 15% to 35%, rather than the 42% to 49% shown in the report. Gary Larson, a spokesman for the California Charter Schools Assn., also criticized the UC Santa Barbara report and said it could be interpreted as painting charter schools -- particularly those that specialize in educating troubled youth -- in a bad light. Charters are independently run but publicly funded campuses that are free from many state and local regulations in exchange for boosting achievement. Daria Hall, assistant director of the Education Trust, a Washington-based nonprofit dedicated to improving education, complained in an e-mail that the report was based on "state-reported dropout figures that are wildly inaccurate." As an example, she said that John C. Fremont High School in Los Angeles, ranked No. 16 in the report, has an official dropout rate of 9%, yet it has more than 1,900 students entering as freshmen but fewer than 500 enrolled as seniors. "Unless almost 70% of the entering class transferred out, and no one transferred in, this school loses more than 9% of its students to dropout," Hall wrote. Rumberger, the dropout project director, said the data were accurate but conceded that the state's method of calculating dropouts leaves a great deal to be desired. "I don't think the data are flawed," he said. "I think the data give an incomplete picture." Hands shot up even before third-grade teacher Tammi Berman had finished reading a sentence in "Flossie and the Fox," a book written in the dialect of the rural South. "Yo'self," she read, and eager students waved their hands. "You ain't," she continued, as even more hands shot up. "You a real fox," she read as more students clamored for her attention. "I think in academic English, it's `You are a real fox,"' one student chimed in. For the 21 students in Berman's West Hills Nevada Elementary School class - four African-Americans and 17 Latinos - the lesson emphasizes the differences between "home language" and the classroom. And it's at the heart of a growing urgency at Los Angeles Unified School District that after more than 15 years of quiet awareness, more now needs to be done to meet the challenges faced by students whose native language is English but who speak vernacular dialects at home. "Until you tackle language, you will not have academic achievement," LAUSD Superintendent David BrewerIII said. "I don't care about the politics behind this. I want to make sure children learn standard English." Rough estimates indicate at least 100,000 of LAUSD's 695,000 students are "standard English learners," comprising the lowest-performing group in a district already struggling with achievement-test scores that lag far behind the state and nation. While the district's estimated 224,000 English-language learners are usually blamed for the district's low scores, the hidden truth is that students whose native language is English but who speak vernacular dialects at home - such as African-American English, Chicano English, Hawaiian Pidgin English and American Indian language - are, in fact, at the bottom. These students, also called "SELs," make up a large portion of the district's early dropouts, have the highest dropout rates, and perform far below even English-language learners, said Noma LeMoine, who oversees LAUSD's Academic English Mastery Program. "We're becoming a little more cognizant of them as a language-learning population, and we're acknowledging them more," LeMoine said. "We see more and more SEL students aren't doing as well as they should be doing." Linguists say the question of why children born in the United States into families who haven't spoken a foreign language for generations still struggle with standard English is at the heart of the challenge. Controversy about the issue flared in Oakland more than 10 years ago after the school board there proposed officially recognizing Ebonics as a language of African-Americans and incorporating it into classrooms to help students learn standard English. Although unanimously approved by one board, the proposal was abandoned when a new board majority - with different political views - stepped in. Aside from the political and cultural sensitivities, there also is no simple test or scientific way to determine who needs to learn standard English. While SELs demonstrate perfectly correct Chicano-English or Hawaiian-Pidgen English, for example, they don't have a mastery of the grammar and syntax of standard English, LeMoine said. "You see this cycle of failure at school primarily because they're not viewed as language-different," LeMoine said. With few districts in the nation more developed than LAUSD, Los Angeles school officials now find themselves at the forefront of reopening a potential national debate on the politically and culturally sensitive issue. LAUSD has implemented an Academic English Mastery Program in 81 schools for students. But so far, LAUSD is one of the few districts in the nation that even has a name for such category of students, indicating "the extent to which people don't want to talk about it," said Carolyn Adger, director of the Language in Society Division at the Center for Applied Linguistics in Washington, D.C.
"LAUSD's program has been out in front for a long time..., and (it) is very well-known," Adger said. "It has the support of the district, and has had for a long time, and in other places you don't have that." But without provisions in the federal government to provide special funds for SEL students, it's up to district leadership to aid the students. LeMoine's department has a $3million budget, but professional training for teachers is not mandatory. School board President Monica Garcia said she's glad the district is finally discussing what it will take to boost all students' proficiency. "And we are challenged in developing an instructional program that is coherent and consistent throughout the district and includes the awareness of different needs of students." Education experts said Standard English simply has to be treated as another language for students to acquire - and that requires professional development for teachers, high expectations for students, reinforcing students' cultural values and building students' academic English vocabulary. "When we hear students who grow up in families who speak `English,' we expect them to speak standard English, not fully understanding the historical impact," Brewer said. And teaching cultural sensitivity is a key component since the four populations identified as SEL are "involuntary minorities" or "involuntary immigrants" - groups that were either conquered, colonized or subordinated in the United States, LeMoine said. Their ancestors generally learned to speak English without the benefit of school - and that's the home language they passed on to their children, experts say. Pedro Noguera, a professor in the Steinhardt School of Culture, Education and Human Development at New York University, said the issue is one mired in political controversy and will take money and a sustained effort to address. "When there isn't the law, then you need advocacy groups, and because parents of these kids also tend to be marginalized, there aren't many effective advocates for these students," Noguera said. "Linguists have encouraged educators not to treat the language they speak as `bad English' because if the language students speak at home with their families is stigmatized, it makes it more difficult for them to learn Standard English." 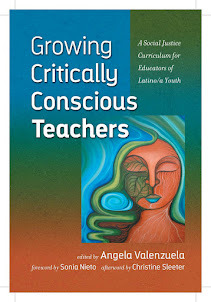 Brewer held a summit of educators and linguists on the issue in December, with recommendations including creating course work and certification for SEL teachers. But the issue also will require political will, LeMoine said. "We have to come up with strategic ways to help these young people to access the core curriculum," LeMoine said. "If they don't have mastery of the language of school, Standard American English, they will have limited ability accessing the core instructional curriculum." But Adger said there is little data on programs for teaching standard English throughout the country, making it difficult to assess which approaches are effective. Teachers at Nevada Elementary said their goal is to validate and embrace the "home language," and that has produced big gains. Students recognize the differences and frequently catch themselves if they switch to their home language in class. "When they recognize it, they're not going to write it," Berman said. "We want them to know that their home language is perfect. Often ... students might feel that their language is being put down." Although Nevada Elementary does not have a large SEL population - such students make up about 8percent of the school's 600 students - teacher Roseann Harrison pushed to join the program four years ago. In her 21 years at the school, she had noticed that African-American students scored below the English learners. "It was something I questioned, but I didn't do anything about it until I heard Dr. LeMoine speak," she said. Since opting into the program, Nevada Elementary has seen a steady improvement in the test scores of its approximately three dozen African-American students. From 2004 to 2007, the percentage of African-American students who reached the goal of proficient and advanced in English Language Arts on state tests rose from 27percent to 36percent. Thirteen teachers at Nevada Elementary now meet three times a month to discuss lesson plans and analyze teaching techniques to meet the needs of SEL students. And being open and supportive is key, the teachers say, recalling a conversation with teachers from a larger school - with 1,300 students - where only three teachers were participating in the program. LAUSD trains 4,000 to 5,000 teachers in methodologies to master the language of school, LeMoine said. A conference is scheduled in April to train 2,000 more, she said. But the struggle of Standard English Learners needs to be a part of a broader national discussion, linguists said, with the understanding that dialects are a way to preserve a cultural identity. "We always project in how we speak something about our social identity, and that's true of these speakers of these vernacular dialects," Adger said. "Part of the reason why vernacular dialects persist is because they're very important attributes of social identity." Brewer agrees about the cultural significance and says that while he speaks standard English - and grew up in a family that spoke standard English - he also can adapt to various situations. "I can go into a different environment and speak another version of English," he said. "I didn't realize what I was doing." And that ability is what all students should have, Adger said. "Being able to shift is quite, quite valuable, and we want to strengthen students' ability to shift like that, so standard English is in their repertoire," Adger said. "We want them to be just as proficient and comfortable in switching as the superintendent is." Washington, DC – – The National Council of La Raza (NCLR), the National Black Child Development Institute (NBCDI), and Representative Hilda Solis (D-CA) will hold a briefing on Capitol Hill on Tuesday, February 26 to urge Congress to provide more support for dual-language programs. Despite the promising results of high-quality dual-language programs, they are increasingly unavailable to low-income students, including English language learners (ELLs) and children of African descent. Representative Solis will discuss the “Providing Resources to Improve Dual-Language Education (PRIDE) Act,” a bill she introduced last fall, and how it aligns with the goals of the No Child Left Behind Act. Dual-language programs have great potential to prepare students for the changing global job market and to eradicate the achievement gap between high- and low-income children. These programs successfully educate native English speakers and ELLs in the same classrooms by developing students’ linguistic and literacy abilities in two languages while at the same time promoting high levels of academic achievement and cognitive ability. BOSTON — Jinzhao Wang, 14, who immigrated two years ago from China, has never seen anything like the huge mansions that loomed over Long Island Sound in glamorous 1920s New York. But F. Scott Fitzgerald’s 1925 novel, “The Great Gatsby,” with its themes of possibility and aspiration, speaks to her. She is inspired by the green light at the end of the dock, which for Jay Gatsby, the self-made millionaire from North Dakota, symbolizes the upper-class woman he longs for. “Green color always represents hope,” Jinzhao said. Some educators say the best way to engage racially and ethnically diverse students in reading is with books that mirror their lives and culture. But others say that while a variety of literary voices is important, “Gatsby” — still required reading at half the high schools in the country — resonates powerfully among urban adolescents, many of them first- and second-generation immigrants, who are striving to ascend in 21st-century America. The novel had fallen into near obscurity by the time Fitzgerald died in 1940, said Charles Scribner III, whose great-grandfather signed the author with the family publishing company in 1919. It was revived in the 1950s and ’60s when Mr. Scribner’s father, Charles Scribner Jr., started publishing a paperback version and a student edition for colleges and high schools. Its popularity soared after Robert Redford played Gatsby in the movie in 1974. In more recent years, a musical version made its debut at the New York Metropolitan Opera and the novel has been turned into a hip hop movie, “G,” set in the Hamptons. The book now sells more than half a million copies a year, with high schools and colleges making up the biggest share of the market, Mr. Scribner said. Jinzhao’s teacher, Meredith Elliott, and other teachers at Boston Latin and other urban schools, say their students see in “Gatsby” glimmers of their own evolving identities and dreams. The students talk about the youthful characters — Gatsby; Daisy Buchanan, the married woman he loves; Tom, Daisy’s husband and a onetime Yale football star; and the narrator, Nick Carraway — as if they were classmates or celebrities. Vimin’s father works in a restaurant — “not very glamorous,” Vimin said — and came to the United States as a refugee from Vietnam. Vimin relates to the story of Gatsby’s rise from the backwoods of North Dakota to New York. “It’s a very inspirational tale, especially when you’re from a background such as Mr. Gatsby,” he said. At the nearby Fenway School, some of Fran Farrell’s seniors, who read “Gatsby” this year as part of their study of the American dream, found different lessons in Gatsby’s life and violent death. Several of her classmates disagreed. “The American dream has a lot to do with money,” said Harkeem Steed, 17, who compared Gatsby to his hero, Jay-Z. These teachers take pains to present the book with a great deal of social and historical context, and they say it crystallizes for many students questions about both the materialism of Gatsby’s dream and the possibility of attaining their own versions of the dream, especially in today’s highly stratified economy. “Here’s Gatsby out of nowhere in this mansion, having these lavish parties and really and truly fulfilling the American dream, and that’s very compelling for them,” Ms. Moran said. “But it’s a cautionary tale, too. For Shauna’s parents, as for the parents of her classmates, one of those gateways is the four-century-old Boston Latin, with its rigorous entrance exams and alumni who include five signers of the Declaration of Independence. A couple weeks later, Ms. Moon and Ms. Elliott wrapped up “Gatsby” and, with “The Adventures of Huckleberry Finn,” “The Joy Luck Club” and “Ethan Frome” also behind them, moved on to the next novel on the sophomore list: “Their Eyes Were Watching God” by Zora Neale Hurston. “The journey toward the dream is the most important thing,” she said. And, she added, “There is a green light beyond the green light.” For her that green light is China, where she hopes to use a Harvard education to help the country develop even faster. Economic mobility, the chance that children of the poor or middle class will climb up the income ladder, has not changed significantly over the last three decades, a study being released on Wednesday says. The authors of the study, by scholars at the Brookings Institution in Washington and sponsored by the Pew Charitable Trusts, warned that widening gaps in higher education between rich and poor, whites and minorities, could soon lead to a downturn in opportunities for the poorest families. The researchers found that Hispanic and black Americans were falling behind whites and Asians in earning college degrees, making it harder for them to enter the middle class or higher. “A growing difference in education levels between income and racial groups, especially in college degrees, implies that mobility will be lower in the future than it is today,” said Ron Haskins, a former Republican official and welfare expert who wrote the education section of the report. There is some good news. The study highlights the powerful role that college can have in helping people change their station in life. Someone born into a family in the lowest fifth of earners who graduates from college has a 19 percent chance of joining the highest fifth of earners in adulthood and a 62 percent chance of joining the middle class or better. In recent years, 11 percent of children from the poorest families have earned college degrees, compared with 53 percent of children from the top fifth. The Pew-sponsored studies are continuing with the involvement of research organizations and scholars. Another report expected in the spring by the more conservative Heritage Foundation will focus on explanations for the trends described in the current report. Mr. Butler said experts were likely to disagree about the reasons and, hence, on policies to improve mobility. Conservative scholars are more apt to fault cultural norms and the breakdown of families while liberals put more emphasis on the changing structure of the economy and the need for government to provide safety nets and aid for poor families. “We may well have an economy that rewards certain traits that are typically passed on from parents to children, the importance of education, optimism, a propensity to work hard, entrepreneurship and so on,” he said. The small fraction of poor children who earn college degrees are likely to rise well above their parents’ status, the study showed. More than half the children born to upper-income parents, those in the top fifth, who finish college remain in that top group. Nearly one in four remains in the top fifth even without completing college. Evidence from model programs shows that early childhood education can have lasting benefits, Mr. Haskins said, although the Head Start program is too uneven to produce widespread gains. In addition, he said, studies show that many poor but bright children do not receive good advice about applying for college and scholarships, or do not receive help after starting college. On February 13, College Board President Gaston Caperton and AP Program Vice President Trevor Packer announced findings from the 4th Annual AP Report to the Nation, which include participation and performance data for each state within the context of its population and racial/ethnic demographics. The report also announced that a greater percentage of the nation's students are taking and succeeding on AP Exams, which research shows are predictors of success in college. Gaps between groups spur equity concerns. Homeland Security won’t say why the border wall is bypassing the wealthy and politically connected. As the U.S. Department of Homeland Security marches down the Texas border serving condemnation lawsuits to frightened landowners, Brownsville resident Eloisa Tamez, 72, has one simple question. She would like to know why her land is being targeted for destruction by a border wall, while a nearby golf course and resort remain untouched. Tamez, a nursing director at the University of Texas at Brownsville, is one of the last of the Spanish land grant heirs in Cameron County. Her ancestors once owned 12,000 acres. In the 1930s, the federal government took more than half of her inherited land, without paying a cent, to build flood levees. Now Homeland Security wants to put an 18-foot steel and concrete wall through what remains. While the border wall will go through her backyard and effectively destroy her home, it will stop at the edge of the River Bend Resort and golf course, a popular Winter Texan retreat two miles down the road. The wall starts up again on the other side of the resort. Along the border, preliminary plans for fencing seem to target landowners of modest means and cities and public institutions such as the University of Texas at Brownsville, which rely on the federal government to pay their bills. A visit to the River Bend Resort in late January reveals row after row of RVs and trailers with license plates from chilly northern U.S. states and Canadian provinces. At the edge of a lush, green golf course, a Winter Texan from Canada enjoys the mild, South Texas winter and the landscaped ponds, where white egrets pause to contemplate golf carts whizzing past. The woman, who declines to give her name, recounts that illegal immigrants had crossed the golf course once while she was teeing off. They were promptly detained by Border Patrol agents, she says, adding that agents often park their SUVs at the edge of the golf course. River Bend Resort is owned by John Allburg, who incorporated the business in 1983 as River Bend Resort, Inc. Allburg refused to comment for this article. A scan of the Federal Election Commission and Texas Ethics Commission databases did not find any political contributions linked to Allburg. In this area everyone knows the Hunts. Dallas billionaire Ray L. Hunt and his relatives are one of the wealthiest oil and gas dynasties in the world. Hunt, a close friend of President George W. Bush, recently donated $35 million to Southern Methodist University to help build Bush’s presidential library. In 2001, Bush made him a member of the Foreign Intelligence Advisory Board, where Hunt received a security clearance and access to classified intelligence. Over the years, Hunt has transformed his 6,000-acre property, called the Sharyland Plantation, from acres of onions and vegetables into swathes of exclusive, gated communities where houses sell from $650,000 to $1 million and residents enjoy golf courses, elementary schools, and a sports park. The plantation contains an 1,800-acre business park and Sharyland Utilities, run by Hunt’s son Hunter, which delivers electricity to plantation residents and Mexican factories. The development’s Web site touts its proximity to the international border and the new Anzalduas International Bridge now under construction, built on land Hunt donated. Hunt has also formed Hunt Mexico with a wealthy Mexican business partner to develop both sides of the border into a lucrative trade corridor the size of Manhattan. Jeanne Phillips, a spokesperson for Hunt Consolidated Inc., says that since the company is private, it doesn’t have to identify the Mexican partner. Phillips says, however, that no one from the company has been directly involved in siting the fence. “We, like other citizens in the Valley, have waited for the federal government to designate the location of the wall,” she says. 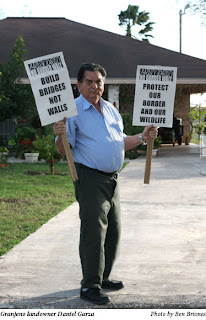 Garza stands in front of his modest brick home, which he built for his retirement after 50 years as a migrant farmworker. For the past five months, he has stayed awake nights trying to find a way to stop the gears of bureaucracy from grinding over his home. A February 8 announcement by Homeland Security Secretary Michael Chertoff said the agency would settle for building the fence atop the levee behind Garza’s house instead of through it, which has given Garza some hope. Like Tamez, he wonders why his home and small town were targeted by Homeland Security in the first place. Most border residents couldn’t believe the fence would ever be built through their homes and communities. They expected it to run along the banks of the Rio Grande, not north of the flood levees—in some cases like Tamez’s, as far as a mile north of the river. So it came as a shock last summer when residents were approached by uniformed Border Patrol agents. They asked people to sign waivers allowing Homeland Security to survey their properties for construction of the wall. When they declined, Homeland Security filed condemnation suits. In time, local landowners realized that the fence’s location had everything to do with politics and private profit, and nothing to do with stopping illegal immigration. In 2006, Congress passed the Secure Fence Act, authored by Republican Congressman Peter King from New York. The legislation mandated that 700 miles of double-fencing be built along the southern border from California to Texas. The bill detailed where the fencing, or, as many people along the border call it, “the wall,” would be built. After a year of inflamed rhetoric about the plague of illegal immigration and Congress’s failure to pass comprehensive immigration reform, the bill passed with overwhelming support from Republicans and a few Democrats. All the Texas border members of the U.S. House of Representatives, except San Antonio Republican Henry Bonilla, voted against it. Texas Sens. Kay Bailey Hutchison and John Cornyn voted for the bill. On August 10, 2007, Chertoff announced his agency would scale back the initial 700 miles of fencing to 370 miles, to be built in segments across the southern border. Chertoff cited budget shortages and technological difficulties as justifications for not complying with the bill. How did his agency decide where to build the segments? Chad Foster, the mayor of Eagle Pass, says he thought it was a simple enough question and that the answer would be based on data and facts. Foster chairs the Texas Border Coalition. TBC, as Foster calls it, is a group of border mayors and business leaders who have repeatedly traveled to Washington for the past 18 months to try to get federal officials to listen to them. Foster says he has never received any logical answers from Homeland Security as to why certain areas in his city had been targeted for fencing over other areas. “I puzzled a while over why the fence would bypass the industrial park and go through the city park,” he says. Despite terse meetings with Chertoff, Foster and other coalition members say the conversation has been one-sided. The Observer called Homeland Security in Washington to find out how it had decided where to build the fence. The voice mail system sputtered through a dizzying array of acronyms: DOJ, USACE, CBP, and USCIS. On the second call a media spokesperson with a weary voice directed queries to Michael Friel, the fence spokesman for Customs and Border Protection. Six calls and two e-mails later, Friel responded with a curt e-mail: “Got your message. Working on answers…” it said. Days passed, and Friel’s answers never came. Since Homeland Security wasn’t providing answers, perhaps Congress would. Phone conversations with congressional offices ranged from “but they aren’t even building a wall” to “I don’t know. That’s a good question.” At the sixth congressional office contacted, a GOP staffer who asked not to be identified, but who is familiar with the fence, says the fencing locations stemmed from statistics showing high apprehension and narcotic seizure rates. This seems questionable, since maps released by the U.S. Army Corps of Engineers showed the wall going through such properties as the University of Texas at Brownsville—hardly a hotbed for drug smugglers and immigrant trafficking. Questioned more about where the data came from, the staffer said she would enquire further. The next day she called back. “The border fence is being handled by Greg Giddens at the Secure Border Initiative Office within the U.S. Customs and Border Protection office,” she said. Giddens is executive director of the SBI, as it is called, which is in charge of SBInet, a consortium of private contractors led by Boeing Co. The group received a multibillion dollar contract in 2006 to secure the northern and southern borders with a network of vehicle barriers, fencing, and surveillance systems. Companies Boeing chose to secure the southern border from terrorists include DRS Technologies Inc., Kollsman Inc., L-3 Communications Inc., Perot Systems Corp., and a unit of Unisys Corp. The agency rejected the auditors’ recommendation, saying 6,000 miles of border is limitation enough. Flossman also calls the University of Texas at Brownsville campus a problem area for illegal immigration. “I wouldn’t assume that these are folks that aren’t intelligent enough that if they dress a certain way, they’re gonna fit in,” he says. Chief John Cardoza, head of the UT-Brownsville police, says the Border Patrol would have to advise his police force of any immigrant smuggling or narcotic seizures that happen on campus. “If it’s happening on my campus, I’m not being told about it,” he says. Cardoza says he has never come across illegal immigrants dressed as students. Flossman goes on to say that Boeing isn’t building the fence, but is providing steel for it. Eric Mazzacone, a spokesman for Boeing, refers the Observer to Michael Friel at Customs and Border Protection, and intercedes to get him on the phone. Friel confirms that Boeing has just finished building a 30-mile stretch of fence in Arizona, but insists other questions be submitted in writing. Boeing, a multibillion dollar aero-defense company, is the second-largest defense contractor in the nation. The company has powerful board members, such as William M. Daley, former U.S. secretary of commerce; retired Gen. James L. Jones, former supreme allied commander in Europe; and Kenneth M. Duberstein, a former White House chief of staff. The corporation is also one of the biggest political contributors in Washington, giving more than $9 million to Democratic and Republican members of Congress in the last decade. In 2006, the year the Secure Fence Act was passed, Boeing gave more than $1.4 million to Democrats and Republicans, according to the Center for Responsive Politics. A majority of this money has gone to legislators such as Congressman Duncan Hunter, the California Republican who championed the Secure Fence Act. In 2006, Hunter received at least $10,000 from Boeing and more than $93,000 from defense companies bidding for the SBInet contract, according to the center. During his failed bid this year for the White House, Hunter made illegal immigration and building a border fence the major themes of his campaign. In early February 2008, Chertoff asked Congress for $12 billion for border security. He included $775 million for the SBInet program, despite the fact that congressional leaders still can’t get straight answers from Homeland Security about the program. As recently as January 31, Senate Homeland Security and Governmental Affairs Committee members sent a letter to Chertoff asking for “greater clarity on [the Customs and Border Protection office’s] operational objectives for SBInet and the projected milestones and anticipated costs for the project.” They have yet to receive a response. Boeing continues to hire companies for the SBInet project. And the congressional districts of backers of the border fence continue to benefit. A recent Long Island Business News article trumpeted the success of Telephonics Corp., a local business, in Congressman King’s congressional district that won a $14.5 million bid to provide a mobile surveillance system under SBInet to protect the southern border. While Garza and Tamez wait for answers, they say they are being asked to sacrifice something that can’t be replaced by money. They are giving up their land, their homes, their heritage, and the few remaining acres left to them that they hoped to pass on to their children and grandchildren. Besides these personal tragedies, Eagle Pass Mayor Foster says there is another tragedy in store for the American taxpayer. A 2007 congressional report estimates the cost of maintaining and building the fence could be as much as $49 billion over its expected 25-year life span. A recent study of the impact of Texas’ public-school accountability system, which served as a model for the federal No Child Left Behind Act, found that it directly contributed to lower graduation rates in the large urban districts examined by creating incentives for schools to welcome the early departure of academically troubled students. The study, by researchers at Rice University and the University of Texas at Austin, found that the loss of growing numbers of students actually led to improvements in how public schools were rated by the state. That’s because most of the students who left schools were low-achieving — and a disproportionate share were black or Hispanic, or spoke English as a second language — which meant that their departure led to an increase in the schools’ average test scores and created the appearance that the school was closing the test-score gap between white and minority students. As school personnel became increasingly focused on the potential positive or negative impact students would have on their institutions’ ratings, they took steps, such as holding back students, which helped raise test scores but also increased the likelihood the affected students would drop out, the study found. "I ask you to please network with other educators so that everyone starts paying attention to what is going on at the State Board of Education. If we do not, the right-wingers will continue to interject their narrow and extremely conservative ideas into all aspects of education." -- Texas State Board of Education member Mary Helen Berlanga, D-Corpus Christi, in a letter to teachers and others this week about the far right's increasing power on the state board. The full letter is reproduced at the end of today's News Clips. State Board of Education member Mary Helen Berlanga, D-Corpus Christi, has released the following letter to teachers and others who opposed efforts this week by far-right board members to scrap a new language arts curriuclum that educators and experts had been developing for two years. The state board's chairman, Don McLeroy, had said he wanted to replace that curriuclum with an alternative offered at the last minute by far-right activist/education gadfly Donna Garner. TFN received permission to publish this letter in News Clips. I want to thank all the teachers, educators, parents, and citizens of Texas for taking the time to give public testimony before the State Board of Education regarding the revision of the state’s English-language arts-reading (ELAR) curriculum standards on February 13. I was very proud of each and every presenter who supported the formal ELAR document that teachers and experts have been crafting and the continuation of work towards its realization. Now, we must continue to be vigilant. The members that were promoting Donna Garne’s alternative document and that was a part of the substitute motion introduced by the Chairman of the Board, Don McLeroy, are planning their next move. A subcommittee was selected by the Chair, so we must watch what they do. I am sure of one thing. They will not rest until they have the contents of the alternative document well-entrenched into the body of the work that the English teachers of Texas have been carefully and meticulously developing for the past two years. What you saw at that meeting is what the other seven moderate board members have been up against since the right-wing members came to power. Know them by what they believe and who they are supposed to represent. Those right-wing board members are: Don McLeroy, Chair (College Station), David Bradley, Vice-President (Beaumont), Rick Agosto, Secretary (San Antonio), Barbara Cargill (The Woodlands), Cynthia N. Dunbar (Richmond), Terri Leo (Spring), Gail Lowe (Lampasas), Ken Mercer (San Antonio). It is not a fight among Democrats or Republicans, but the reckless idea of the right-wing members of the board trying to impose their social agenda into the fabric of education in Texas. Many of these individuals are home-schoolers who do not even support or believe in public education. They believe in promoting charter schools and vouchers, and that is an agenda that undercuts the work of public education. I ask you to please network with other educators so that everyone starts paying attention to what is going on at the State Board of Education. If we do not, the right-wingers will continue to interject their narrow and extremely conservative ideas into all aspects of education. In a few months we will be discussing the science and biology textbooks. Their goal is to put Intelligent Design in the same science books with the theory of evolution. I think that these two philosophies have merit, but neither belong in the same textbook nor should they be taught as such. Please alert your science teachers of this fact and join the thousands of scientists from around the country who have signed off against this idea. It is not the will of one person or one group that should be heard but rather the will of the people who live in a free and Democratic society. I want to thank you once again for your dedication and your willingness to hold fast to the courage of your convictions. I congratulate you and wish you all the best in the hard work that you do every day with this precious resource you work with on a daily basis, the children of the state of Texas. "Education, the Way It Ought To Be"
The standards in the ELAR/TEKS must be understandable to the general public -- to the typical student, parent, classroom teacher, and administrator. The ELAR/TEKS need to be specific for each grade level so that true accountability for teaching and learning is clearly established. Under No Child Left Behind, grade-by-grade objectives are required to be established from Grades 3 - 8. Because the Texas Legislature passed SB 1031 (effective 9.1.07) and the Governor has signed it into law, high-school students in Grades 9 - 12 will be taking a series of twelve end-of-course tests. The new ELAR/TEKS standards must be grade-level specific so that the new end-of-course tests can be built on the standards. The Texas State Board of Education has determined that the new ELAR/TEKS are to be (1) measurable, (2) grade-level-specific, and (3) explicit. Because there are two entities in every classroom (the student and the teacher) and each has a different point of view, I recommend that each page in the standards document be formatted into two columns. The left column should tell teachers what elements shall be taught at each grade level according to the curriculum requirements adopted by the Texas State Board of Education. Teachers, however, should not be told how the curriculum requirements should be taught. That decision needs to be left to the creativity of each teacher. The right column should tell students and their parents what the students should learn. With this simple format, teachers can look down the left column to see what it is that they need to teach; and students and their parents can look down the right column to see what students should learn. By having a simple, easy-to-understand format, stakeholders throughout the state will know what the goals at each grade level are; and the chances of bringing about widespread education reform in our public schools will be dramatically increased. To meet the SBOE mandate, the elements in this strand must be measurable (assessable), grade-level-specific, and explicit. Because all teachers need to stress good listening and speaking skills to their students, it is my recommendation that the responsibility for teaching these skills should be shared across the curriculum. I recommend that in Pre-K through Grade 2, listening and speaking should be a part of the language arts in general. In Grades 3 - 12, the emphasis in English classes should be limited to group discussion processes and oral presentation skills. To graduate, all Texas high-school students must take a speech course where they learn and practice the fundamentals of good speech communication; therefore, English teachers (Pre-K through Grade 12) should not be charged with a heavy emphasis on the teaching of listening/speaking skills since students will receive this instruction in their speech communication class before they graduate. This strand should address fiction, poetry, and dramatic literature. It is important for children to learn to read in Pre-K through Grade 2 and then begin to move toward reading to learn as they move into Grade 3. By Grade 3 students should be reading the great pieces of children's literature for themselves and in large quantities so as to build automaticity, fluency, comprehension, vocabulary, and textual knowledge. Students need to be taught higher-level reading skills such as drawing conclusions, inferences, fact/opinion, predicting outcomes, making generalizations. The emphasis in the classroom should be on the printed word. I suggest that each grade level should focus on a specific literary emphasis and on specific literary terms taught in conjunction with the literary selections. For instance, this could mean that in Grade 3, students would read about King Arthur and the Knights of the Round Table. In Grade 4 the emphasis might be on myths and legends from around the world. In Grade 5 the emphasis could be on famous people; Grade 6 could be on classical mythology. Grades 7 - 10 could emphasize literary terms and devices as used in great pieces of American and world literature. English III should emphasize American literature, and English IV should emphasize British literature. Particularly in Pre-K through English II, English teachers should emphasize what is actually in the literary work and should not attempt to spend too much time on the historical context in which the selection was written. By English III, however, English teachers should place more emphasis on the historical context of a selection and its influence on the culture. Students in English III and IV should be taught to compare and contrast various works, research the accuracy of information presented by the author, analyze and synthesize information from a variety of sources, and recognize styles and characteristics of major works. Students should be taught to determine the true intent of the author without imposing the subjective interpretations and judgments of the reader. This strand should address expository, persuasive, and practical texts (e.g., business letters and envelopes, written instructions, bus schedules, etc.) in written form. Students should also learn the differences between paraphrasing and summarizing. They should learn about quoting and plagiarizing, critical thinking, and critical reading. This strand should scaffold vocabulary skills so that they increase in depth and complexity from one grade level to the next and so that they connect with the specialized vocabularies presented in the literary selections. This strand should emphasize significant spelling rules, word families, similarities and differences in the spellings of groups of words, and specialized spelling lists. A strong emphasis on the spellings and meanings of homophones should be taught at each grade level. This strand should address expository, persuasive, practical, and "creative" writing with grade-by-grade development of the elements of composition. Students should be taught a steady progression of skills which move learners from writing correct words to correct phrases, sentences, paragraphs, compositions, and research papers. Before students are taught how to write multi-paragraph compositions, they need to learn the fundamental parts of a good paragraph (e.g., audience, topic sentence, supportive ideas, conclusion, transitional devices, coherence, and point of reference when appropriate). Then they need to be taught how to progress from a good paragraph into a multi-paragraph composition, making sure students understand how a topic sentence in a paragraph transitions into a thesis statement in a composition. Students must be taught the four writing genres (i.e., narrative, descriptive, expository, and persuasive) and their distinctive characteristics, helping students to develop facility to utilize each of the four types at will. Under the narrative genre, students should learn such concepts as author's point of view, theme, audience, narrator, dialogue, development of characters, structure of paragraphs, outlining, plot, setting, foreshadowing, chronological order, and sequencing. Under descriptive writing, students need to learn the use of vivid verbs, mood, order of importance, gathering details, chronological/spatial/logical order, figures of speech, similes/metaphors, descriptive adjectives, the use of sensory details, and logical order. Expository writing must be text-based (i.e., reading-based) with evidence provided from something a person has analyzed (e.g., factual phenomena in science or history). Students must be taught the differences between expository and persuasive writing so that they do not insert their personal feelings, emotions, and/or opinions into expository writing. They also must learn to use third-person pronouns in their expository compositions. Under expository writing, students need to learn to establish the credibility of sources, fact/opinion, source attribution, plagiarizing, paraphrasing/summarizing, and supportive details. Learners also need to learn a step-by-step progression of research skills which can start with simple steps in Grade 3, culminating in the literary criticism/analysis research paper in English IV. Under persuasive writing, students need to learn the persuasive writing strategies such as sensory images/explicit words, action verbs, descriptive adjectives and adverbs, defining terms, giving accurate information, exaggeration, drawing attention to similarities and differences, examples, metaphors, personification, indirect references, description of personal qualities, personal stories, dialogue, and comparison of two sets of ideas/situations/things. This strand should address a competency-based, formal study of grammar and usage (e.g., punctuation, capitalization, spelling, syntax) which increases in depth and complexity from one grade level to the next. Because of its tightly sequenced elements, I recommend the use of the grammar strand found at http://www.educationnews.org/Curriculum/TAD/tad_download_area.htm . (Please scroll down to Subchapter D, Teachers' Supplementary Guide, 110.55. Grammar, Grades 4-12.) Since the writers of this grammar strand have claimed no authorship or copyright privileges and the strand is free for the taking, the writers of the new ELAR/TEKS should import this grammar strand directly into the new standards. I am torn about naming this a separate strand. I really believe the skills taught here should go under expository writing and should build at each grade level until students are finally able to write a well-written research paper. The problem with having a separate Research strand is that the ELAR/TEKS writers will have to make sure the Research strand elements are aligned exactly with the Composition strand elements. If they do not align exactly, students might find themselves being required to write something for which they have not had suitable prerequisite instruction. The only changes I would make would be to add pieces of Biblical literature at each grade level which would prepare students for literary allusions and themes which are so common in classical pieces of literature and on college-readiness tests (e.g., Advanced Placement, International Baccalaureate, ACT, SAT, CLEP exams): David and Goliath, The Parable of the Good Samaritan, Noah's Ark, The Tower of Babel, Joseph and His Coat of Many Colors, The Parable of the Prodigal Son, Jonah and the Whale, The Parable of the Lost Sheep, selections from the Hebrew Bible (Old Testament), New Testament, King James Bible. Students must also know these Biblical allusions to be equipped for college courses: The Journey in Canterbury Tales; The Fall in Paradise Lost; The Quest in Idylls of the King; the battle between Good and Evil in Paradise Lost; Heaven vs. Hell in The Divine Comedy; Fire vs. Ice in Dante's Inferno; the archetype of the Hero as seen in Joseph, Moses, Elijah, Jesus Christ; the Devil Figure called Satan; The Woman Figure (The Platonic Ideal) inspired by the Virgin Mary; The Trinity, The Cross, Temptation/Sin, Forgiveness/Redemption, Obedience/Punishment, Creation, God as a Power, Angels/Devils, Heaven/Hell, Twelve Tribes and Apostles, Self-sacrifice, Forbidden Knowledge, Courage in the face of great danger, Value of Suffering, Prejudice (racial, political, and religious), Human Nature, Faith in Human Nature, Triumph from Adversity, Poetic Justice, and other Biblical archetypes and themes. Keyla Aguilar is working harder in all of her classes these days. Joshua Tenorio is doing the same. Well, they’re both getting a second chance to graduate from high school. Joshua says he wasn’t able to get the personalized help he needed. Teenage complaint perhaps, but his claim is supported in a new study by Rice University and the University of Texas. So, the very program designed to make sure kids perform better may actually be pushing them out. “The system as its constructed doesn’t provide incentives for keeping them in because these are the very kids who are gonna score the lowest on the tests,” said Eileen Coppola with Rice University. According to the study, every year, Texas public high schools lose at least 135,000 students before graduation. “We get a lot of those kids because they need a smaller campus, smaller classroom so that more attention ca be provided them,” said school principal Richard Farrias. Researchers hope this new report will help educators do more to make sure all students are successful. Students attending schools with higher poverty rates and minority populations are more likely to have less experienced teachers, according to a statewide study. Five Rio Grande Valley school districts — Brownsville, Edinburg, La Joya, McAllen and Pharr-San Juan-Alamo — were included in the study from The Education Trust, which compared teacher experience and pay at 50 of the state’s largest school districts. But area officials wonder how the study can decipher which campuses are “low poverty” or “high minority,” because their districts are homogeneous. The vast majority of students attending schools in the Valley are Hispanic and most school districts serve high percentages of low-income students. “It doesn’t make sense to me,” said Brownsville schools Assistant Superintendent Susan Fox. The study — “Their Fair Share: How Texas-Sized Gaps in Teacher Quality Shortchange Low-Income and Minority Students” — compared the average income among teachers working in schools with the highest and lowest poverty rates, as well as those with the highest and lowest percentages of minority students. It also looked at teacher turnover rates over a five-year period. And it looked at how many children in each school of each district received free or reduced lunch or other public assistance to determine the lowest to highest poverty schools. Student populations at each school were also reviewed to determine which ones served the highest and lowest percentages of minority students. The study shows students attending schools serving low-income families and a large percentage of minorities are more likely to employ less experienced teachers, as well as those who are not certified in the subjects they teach. It also indicates teachers working in those schools, on average, earn less than their counterparts at more affluent schools with fewer minority students. The data proves that school districts throughout the state continue to assign newer teachers to schools where there are more low-income and minority students, said Heather Peske, director of teacher quality at The Education Trust. Local school leaders said they don’t assign new teachers to schools. Instead, individual campus principals hire new teachers based on their open campus positions. There are teachers who want to stay in some schools and others who want to transfer out once an opening is available at another campus, said Edinburg schools Personnel Management Systems Supervisor Margarita Oyervides. Teaching slots are based on student populations, so schools with more students will have more available teaching positions. Every April teachers are given a two-week window to request a transfer to another school. The principals of the schools where they currently teach have to approve the transfer and teachers have to apply and interview with the school where they want to work, Oyervides said. “What we do not want to see at a campus … (is) for them to have teachers wanting to leave,” she said. To help teachers and schools, the district offers gas stipends for teachers who have to travel farther to the schools where they work. It also started a district-wide mentoring program for new teachers to encourage them to stay in the teaching field, Oyervides said. “We’re trying to give teachers what they need,” she said. San Antonio parents who send their kids to Catholic schools using privately funded vouchers are reeling from a sucker punch they didn't see coming. Quietly, and with little fanfare, the Children's Education Opportunity Foundation of San Antonio began notifying parents a few weeks ago that the program would end with this school year. CEO San Antonio is the sister program to Horizon, a voucher program for kids in the Edgewood Independent School District. Both are funded by San Antonio businessman James Leininger, arguably the state's biggest support of school vouchers. Jessica Almanza has sent her daughter Jenna to St. Leo the Great Catholic School with a CEO voucher for the past five years. She said she'd find a way to keep her daughter there. "My first thought was, 'What are we supposed to do now?' This is our choice. Are we supposed to abandon our choice?" Almanza said. "I'm not saying public schools are bad, but this is what's right for my daughter." Horizon, the better known of the two programs, was billed as a decadelong experiment to prove that vouchers not only will help students who use them to go to private schools, but also improve public schools by providing competition. It currently serves 1,703 Edgewood students and is scheduled to end this year. But CEO, which serves almost 700 students, has been available for students all over San Antonio and pays up to $1,500 a year in tuition assistance — just under half of the cost of most Catholic schools' tuition on the South Side. The program wasn't scheduled to end this year and it left parents, and Catholic school leaders, surprised. "We thought CEO was going to continue indefinitely," said Carol Johnson, principal of St. Leo's, where 43 of 186 students use CEO vouchers. "Parents have considered it a blessing that CEO was there for them. Otherwise a private-school education would be beyond their means." Jessica Sanchez, CEO director, said the scheduled end of the Horizon program had a huge influence on the decision to close CEO. She said rising operating costs also were a factor. Voucher critics speculate that shuttering CEO and Horizon might mean the end of the voucher debate in Texas. Leininger, who has spent $50 million funding the programs, long has lobbied for a publicly funded voucher program. During the 2005-06 election cycle, Leininger spent nearly $5 million, targeting five Republican lawmakers who voted against taxpayer-funded vouchers, and supporting their challengers in primary elections. Two of those five lost their seats. But Ken Hoagland, a spokesman for Leininger, said they're not giving up. They'll continue to lobby for a publicly funded voucher program at the grass-roots level as well as reach out to legislators that represent inner-city districts, Hoagland said. "Dr. Leininger's hope was that when state legislators saw the results of letting parents choose any school they wanted for their child that they would see this is a reasonable solution to the high drop-out rates in public school," Hoagland said, pointing out that more than 90 percent of students in the Horizon and CEO programs not only graduated from high school but went on to college. "Even those results were not enough to convince the legislators of the virtues of school choice." Hoagland said Democrats in other states are beginning to warm to the idea of school choice — a broad spectrum that includes charter schools and voucher programs. He still hopes to convince lawmakers, Democratic and Republican, that vouchers are a good idea. "We're just going to keep trying and not make this a partisan issue," Hoagland said. "Really, his (Leininger's) passion is for the children not the politics. Dr. Leininger has tried to win this by putting lots of money in the election process." Now the focus is on a more grass-roots effort, he said. Kathy Miller, president of the Texas Freedom Network that opposes school vouchers, said there's no indication Leininger's experiment made things any better for students left in public schools. She said the steady academic improvement in Edgewood ISD over the past decade began before the voucher programs were launched. "All along, Dr. Leininger intended his privately funded vouchers to spur a publicly funded program and all of those efforts have flopped in legislative sessions," Miller said. "I think it's clear that Texans don't want vouchers, and it's been clear in every legislative session for a decade." Mexican education comes to U.S.
Top Issue For D.C. Schools? Parents.